The inside of the chambers are accessed through a “door” running the length of the gear. The nets are laced closed by threading a thin plastic line through the mesh. Lantern nets with extra mesh by the doors are much easier to lace than nets in which the webbing must be pulled together. The latter nets are even more time consuming to tend. 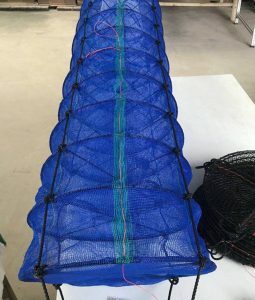 The most common choice of mesh size for spat nets is 7.5 mm. These nets can accommodate spat as small as 15 mm, but 20 mm and larger spat work better. This small mesh size fouls easily, contributing to less water flow through the nets and, consequently, less phytoplankton for the oysters to eat. While it is important to increase mesh size as the shellfish grow larger, you really don’t need to go larger than about 21 mm (about 1 inch) to get a good flow through the nets. 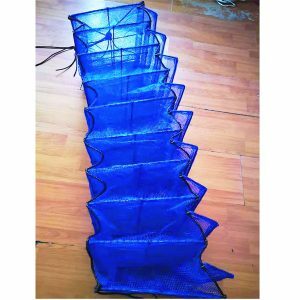 Lantern nets are extremely durable. Yes, many of the nets have been repaired several times, but unless they are crushed it has been possible to repair damaged nets with cable ties, weed whacker string and, occasionally, a piece of salvaged webbing. Sometimes it is necessary to bend a twisted wire, but repairs are possible, although sometimes labor intensive. The biggest enemies of lantern nets are too much time in the sunlight or the water, and careless handling and storage.